The Department of Culture has recently issued a circular stating that they will not allow carving or painting religious figures and mantras on rocks along the road and cliffs. The department has come up with such move to preserve the sanctity and essence of Buddhist spiritual figures. 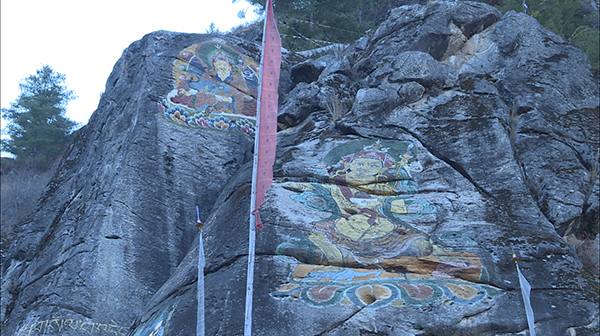 The culture department also said that with modernization, carving and sketching religious figures on rocks and cliffs have become a trend, over the past few years. The Culture Officials shared that they observed people misusing various religious objects and symbols which is inappropriate. “These days, we see religious piece like butter lamp, offering being used as decorative piece and jaling and dung as a handle of the door which actually deserve to have a better place. The objects are meant to be kept inside the temples and not used for decoration. It is our responsibility as Bhutanese to be careful in preserving our culture and tradition,” said the Chief of Cultural Properties Division of the Department of Culture, Phendey Lekshey Wangchuk. The department now plans to sensitise people to discourage from misusing the religious figures and objects.